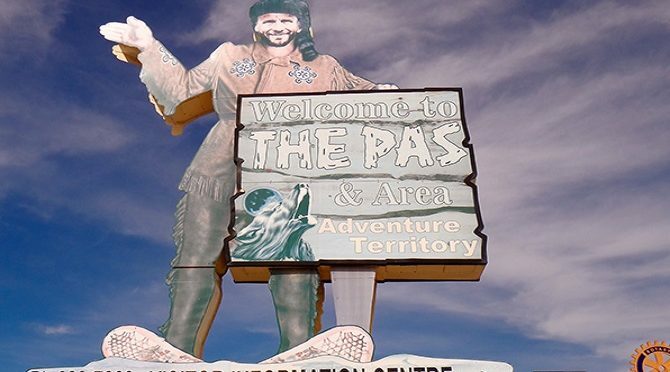 The Pas might not be the first community that comes to mind when you think of places to visit in Manitoba. In fact, like me, you might not even be certain how to say the town’s name. I wasn’t, when my husband was offered a teaching job up here nearly four years ago. Actually, I didn’t even know where we were moving – at first I thought The Pas was in B.C. 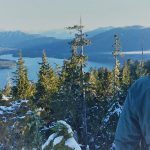 – but as a writer with a portable job and an adventurous spirit, I was all-in, even if I did need somebody to tell me what I’m about to tell you. The ’s’, dear reader, is silent. Say it with me now: The Pa. There. Armed with this primary local knowledge, you’re now ready to disembark at our historic train station, built in 1928, and explore this surprising town. 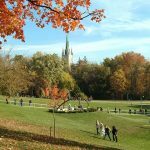 Situated 640 kilometres north of Winnipeg, it’s got a lot to offer: a rich Indigenous, Metis, and European settler history, a stunning setting beside the Saskatchewan River, unique sights and a few special souvenir options to take back home. Start at the Sam Waller Museum. A bit of a northern eccentric, Waller amassed a huge collection of oddities and artifacts during his lifetime. When he retired in 1958, the former teacher opened his hoard to the public, advertised it as “the Little Northern Museum” and thousands came calling. 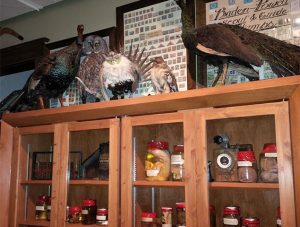 His eclectic collection – including my favourite, a deliciously creepy collection of preserved animal embryos in murky jars – is now housed in the original 1916 courthouse. Don’t miss the wooden drawers full of treasures like Inuit carvings, painted Pysanky eggs and Mexican fleas dressed in formal-ware (use the supplied magnifying glass). Located in the heart of downtown, the Museum also gives a good primer on the area. Learn about Indigenous history, the fur-trading, steamboat and logging eras, and Canada’s first female undertaker, who lived and worked in The Pas. Check out the original jail cells in the basement and take in current exhibits by local artists. In the upstairs gift shop, purchase locally-tapped birch syrup, books by area authors and other souvenirs. After all that history, hit the pavement to help you process. 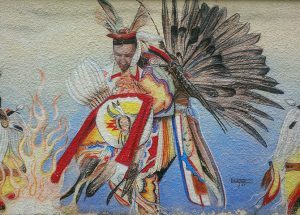 Take in a few of the town’s gorgeous murals or walk west towards LaRose Avenue to see the community’s oldest houses (some apparently haunted) and hook onto a 10-kilometre-long walking path that loops around town. Part of the trail leads along the southern shore of the Saskatchewan River where canoes and steamships once travelled. Enjoy the golden glow of tamaracks and poplar leaves and keep your eyes peeled for bald eagles flying over the Opaskwayak Cree Nation on the opposite shore. When your stomach starts growling, there are several options from fast food to fine dining. 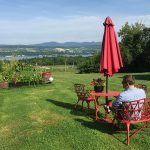 My favourite is the Wescana Inn where you can get a feed of local pickerel or try Good Thymes with its energetic atmosphere and varied menu (including gluten-free options). Miss The Pas, a popular local diner doubles as a veritable museum. 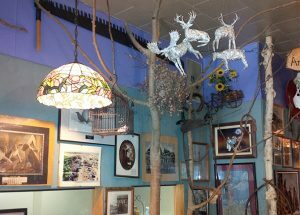 Enjoy their all-day breakfast (or just grab a coffee) while perusing the spread of photographs, bead-work, and delicately crafted tin-foil sculptures of antlered moose and deer which crowd the walls and ceiling. Still hungry? If it’s Friday around quitting time, follow the locals to the Royal Canadian Legion for Meat Draw. Before I moved north I’d never heard of such an event but living so remotely means being open to new social experiences, especially as darkness creeps closer in the fall. These days, you might find me eyeing raffle tickets – a buck a strip – in the hopes of winning a roasting chicken or a rack of ribs. 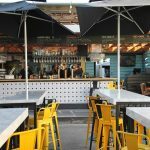 If you aren’t sure what you’d do with said prizes (and newbies seem to be lucky), chip in for the final 50/50 draw, play a game of shuffleboard and stay for the friendly vibe. If you’re interested in gambling for something other than a slab of sirloin, grab a cab over the river to the Aseneskak Casino where you can hit the slots, or catch a live band or jigging (dancing) competition in the Eagle’s Nest Restaurant. Or, end your evening at the movies. 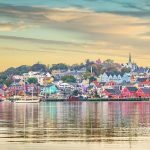 Even in this small town, you can choose from up to three films per week – and the setting can’t be beat. 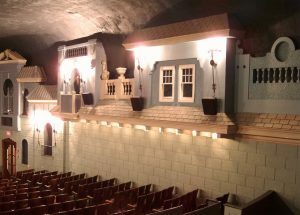 Built in 1929, the Lido Theatre (cash only) is one of the last and best preserved atmospheric theatres in Canada. Popular in the 1920s, these theatres were designed to transport audiences to imaginary European settings. Munch popcorn and watch the latest blockbuster while surrounded by faux-balconies mimicking a medieval courtyard – as movie-goers in The Pas have been doing for 87 years. 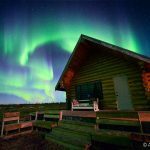 After your busy exploration of one of the most unique places to visit in Manitoba, you might be ready to slip into your pyjamas and head to bed. But before you do, make sure you’re equipped with an essential accessory. 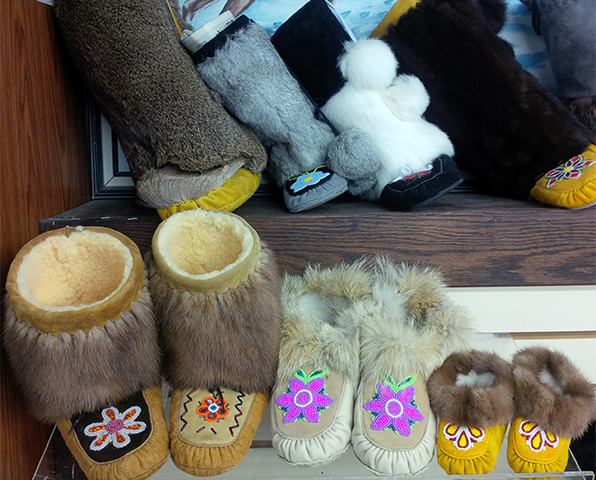 Pick up a pair of moccasins or mukluks at White Feather Cree-ations, where custom leather-work and intricate beading are done on sight, or Jane’s Crafts & Hobbies, which sells a variety of the slippers made by regional artisans. Take it from a local: these will keep you warm when you tread this northern ground. Have you visited The Pas? What are your favourite spots? Share them with us by commenting below.